Chair: 21 Inches Wide, 25 Inches Deep, 35 Inches High. Dining Table: 42 Inches Round, 30 Inches High. If you're on the hunt for a dining set to satisfy your exotic tastes look no further we have it for you right here! Get the safari look without the trip! 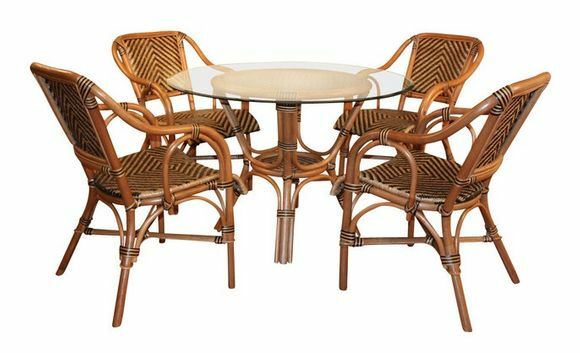 This rattan dining furniture will give you a combination of exotic style and simple casual seating for you and your guests. -Lightweight chairs allow you to easily move the furniture when necessary. Forgot about struggling to move your seat, it's a breeze with our rattan furniture. -This hard to find retro look easily allows you to enchant your company over a nice dinner, brunch, or late night drink. The stand alone view of the Safari rattan dining chair brings you to the elements for exotic interior design and a way to bring the interesting and unique to your dining area. Perfect for the sunroom or porch, our Safari rattan will even bring the outdoor bistro decor you have seen in some of your favorite restaurants.